Women's Original Nebula Short Rain Boots is rated 4.8 out of 5 by 5. Born from the concept of shadow play, the Nebula collection encompasses the excitement of bright lights and dark nights. 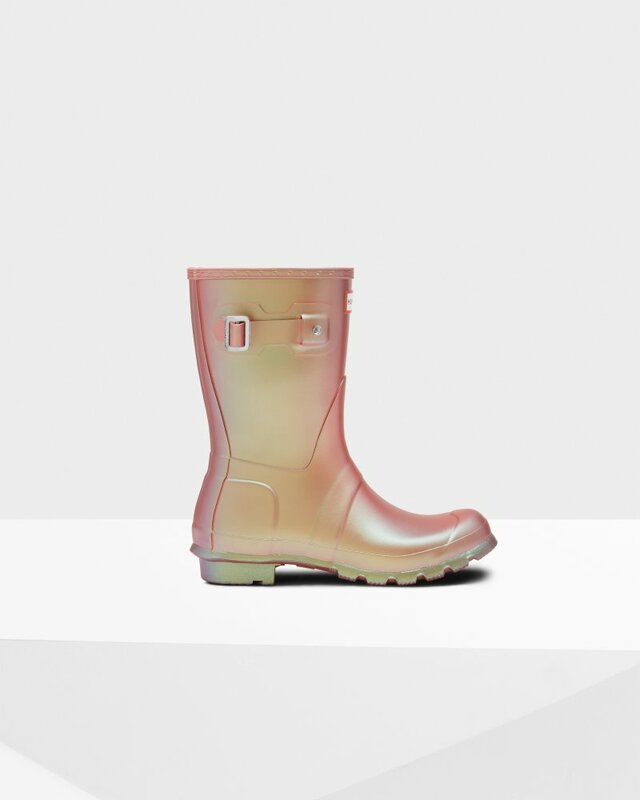 Utilising a two-tone iridescent finish that shimmers through metallic pastel hues as it moves in the light, the Original Short Boot is given a glittering update. Perfect for wet weather conditions this women's rain boot is a shorter version of the iconic Hunter Original Tall Boot. Formed of natural rubber, each boot is handcrafted and assembled over three days before being vulcanized for superior protection. Featuring the Hunter Original tread pattern, and a comfortable polyester lining, this boot is a rainy-day necessity. This style is for general wear. For performance boots designed for long-term use on hard terrains, we recommend products from our Field range. Rated 5 out of 5 by Swim2muchD from Even better in person! These are so cool, they change color as you move. Very back to the future II. Comfortable, and sized right. I have larger calves and have no problem with these boots. Rated 5 out of 5 by Beth-Mij from Awesome color!! These boots are the coolest color in existence! I've even received compliments on them from complete strangers while shopping at the grocery store. Very comfortable boots (as always) - great for every day, not just a rainy day. Rated 5 out of 5 by erinceleste from Awesome Colour and Perfect Fit These fit perfectly and the colour is fabulous. I now want the other nebula colour. Rated 5 out of 5 by elizabethw from LOVE I absolutely love these boots. I got the pink ones, and I feel like I can them with anything to add a little pop to my outfit. They’re beautiful and extremely durable. Definitely one of my new favorites. Rated 4 out of 5 by Jlusk4 from Pretty color Color is awesome. Bought them for my daughter and I’ll admit, I love them too:) only downfall is that they scratch/scuff very easily. Just got them for my daughter for Christmas and they are already stuffed up pretty bad.